If you haven’t seen this animation that made/is making the rounds around the interwebs RSA Animate – Drive: The surprising truth about what motivates us and if you want something to think about it’s worth the 10 min of your time. Dan Pink from the RSA ( Royal Society for the encouragement of Arts, Manufactures and Commerce) gives a speech, and they have turned it into a very clever animation about what motivates or drives us. The talk was aimed at more company’s, and employers – and basically that treating people like donkeys by waving carrots in front of their face is not how your going to get results and good performance. Note that this isn’t about fun, it’s about engaging people the right way for better results. I am going to throw the idea out there – that the people who participate. ( Not troll. Participate) in the / a community by contributing things on forums, blogs, boss guides, even if it’s a small community like your guilds, that they are better players than the people who don’t. They have more understanding of the game, do more, have better opportunities, keep more up to date with whats going on, know where the best information sources are also more importantly share what they know and most do it for free. This is all relates back to Autonomy – Mastery – and Purpose. What does a video about motivation have to do with wow? If you are reading this, then you already think things about the game beyond the screen in front or you. Your already on the path of Mastery and a lot of you show that you have purpose too, by your contributions. As per the speech. Most bonus scheme philosophies, in any business or activity is to reward the top performers. If you do better than anyone else you get paid or rewarded, but the study where students from MIT and replicated in rural india participated in tasks found that “Higher incentives led to worse performance” the moment the task stopped being simple. Do you think paying a guild to play will make them perform better? Wonder why things like guild supplied Enchants, Gems, Food and Flasks – performance or kill bonuses, effectively paying them to raid, won’t make your guild perform better? Good players already have sourced the things that will make them perform better. To get a guild to perform better, Based on the idea of Autonomy – Mastery – and Purpose, it could just be as simple as getting the guild involved more in the discussion of the raid, where everyone feels important, and that they are contributing to the greater plan – and are not just another dps, or heals, that they have voices and those voices matter. Purpose – making the world a better place, and feeling like you are making a contribution. When I was working on Yogg I had a special dispel spec for that purpose. I was doing most of the cleansing, and I was running out of mana, so I approached my Class leader, told him my problem , and that I wanted to try this spec so I could do my job better. He said fine, and the results spoke for themeselves. I was allowed the Autonomy to solve a problem, proved I could master it, and then felt purposeful because I could see that I was being useful and helping contributing. The Workforce wants engagement because engagement means better results, and you can apply this to a guild setting as well. I was fully expecting to pay the 1k duel spec cost, So cringing at losing my 1k , much more precious since my main gold earner is off server – I asked the Priest trainer for training, and Oh.. It’s only 100 now – There is now NO excuse to not have duel specs. It was very easy to slip back into the ” Oh I need to be home by *this* time because I said I would be available thursday night as well for the follow-up raid, and make sure washing was done, garbage was out, shopping done, dinner was made, cat was fed, new light bulbs bought – all so I could be available to raid. I’m not saying that this is a bad thing, but I work full time, and while I don’t have any family responsibility I was really enjoying being able to say – ” Sure – let’s go have a drink ” or go shopping or not log in, and not worry or fret that I was going to miss out on a raid. I’m not pretending I have an exciting life – and I’m certainly not doing as much as I was pre WOW, and some of that is financial, Eg expensive singing lessons v Mortgage payment. Mortgage won, but I got to see a few friends in the last few weeks that had been too difficult to arrange otherwise – trying to fit into each others lives is much easier when someone doesn’t have a 4 night a week standing committment ( Looks pointedly at myself) and the last few weeks have been a lot of fun. On the other hand my scrub pugging attempts on my main, v an organised, run on an alt has taught me that some people will never raid in such an organised environment, and will have missed out, not just on content, but also just being surrounded by dedicated , and competent people – and as much I really don’t want to do 4 night raiding a week – um maybe only for a little while yet. 4 nights gets you places that pugs/casual will not. In the scheme of things – what you miss out on by doing something 4 nights a week in real life is also a cost, and I was kicked out of a musical bout 18 months back ( I shouldn’t be proud of that – but I missed a ‘compulsory’ musical rehearsal for a raid, – It worked out for the best as I was hating doing it. A Board game will never be the same for me. But it does interfere with RL – how much you let it interfere is completely up to you, and yes I have been accused of picking Warcrack over wanting to see someone. Leveling is fun. Well, leveling a character you like playing, that has many fun things to do is well FUN. My 80 hunter says at least log in every now and then so I can feed my pet! Sure it took some cash and a little bit of leg work, chasing down the BOA head, and shoulder chants, making sure she got a proper weapon enchant. Waved goodbye to Heirloom stuff. She leveled at Prot all the way – had to do some respecing to get into a cookie cutter spec, I had done ok with my choices, but cookie cutter is awesome for someone who wouldn’t be able to argue with another warrior about warrior stuff yet. She did it with my usual mix of Quests, BG’s and Instances. It’s the only way to level for me now. The variety keeps me interested, Quests, and killing stuff on my own makes me confident in my keys/abilities, BG’s forces me to react faster and try to survive ( and I get to charge a lot ) and Instances I get to practise Tankage. I had to leave my BOA Shoulders in my bags while tanking a while ago, so its’s been 10% slower, but I was easier to heal with properly stat’d shoulders. I have some gear gaps, and I hope I shall be able to sneak my way into some places that don’t normally take people without an achievement. No I shall not lie. Probably confirmed I am a bad tank by running with a friend and him getting smacked around more then he liked. Running with people I want to impress makes me more nervous. I had my first group dissolve on me last night in Oculus. OH HOW I HATE THEE. I let the healer die on the 2nd whelp trash pack. Which was my fault for being unable to control all those casting whelps well enough. On the 2nd boss – Mage- Lord Urom we wiped 3 times, the raid kept blowing up – because DPS was slow and we don’t have a lot of health, and no one los his blast, or they time bombed each other. BYE BYE healer again. Of course it was my fault for making the DPS run cross the frost. They wanted me to run to them, they could have run in front of my kite path but nooo.. and I’ve never seen a tank run at the DPS. I’ve always been a dps or healer running after the tank. 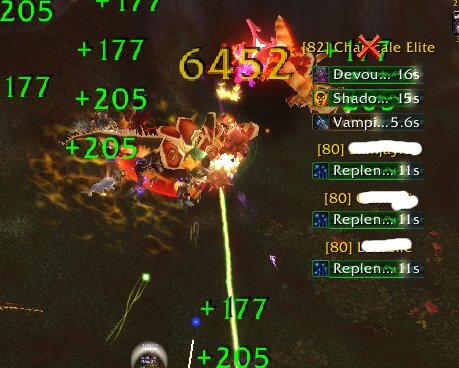 Every time I get the achievement spam for the 1st time I completed a dungeon, on normal, or heroic – I feel a little smug. They didn’t know it was my 1st time here as tank 🙂 but I feel good that I have been able to play a completely different role, and I’m ok. It will take some more work to become a good tank – and I’ll work on her. Need those frostbadges. That Old Familar Vent Channel. I recently found out that an old guild Vent had lapsed, I hadn’t logged into it for a while, I’ve used skype more lately or Msn voice or another vent then the old guild Vent. For a while it had been a place where the ex guildys could log in, and sometimes hear a familiar voice and catch up on what ever adventures we had been up to – playing wow or not. That I hadn’t logged in for so long was testament to how much it had lapsed – and yes it needed people to keep paying for it to stay up, and I had paid for 2 months – but had forgotten how long ago that was, it’s no ones fault, just wasn’t being used enough for people to care – myself included. The vent had been rented out to new people – and it was a tad upsetting to see all the channels gone. I logged in expecting to see remnants of in-guild jokes, and channels named after people, for people, private channels and the standard raiding & pvp channels . I ended up in a lobby. I always meant to screen shot our Vent channels, and write a post about it, because you can tell a lot about a guilds personality and structure by their vent channels. Their interests, how social they are, what other games they play ect. In contrast to the guild I am in now – the old one was very chatty. Or maybe it was me that was chatty, but every day before raid or in raid channel until raid started someone was always talking, and I miss the epic conversations. I find it eerie now to be sitting in a raiding channel waiting for the raid to start, and there be silence, or even when one person speaks something as simple as Hi Guys – be lucky to get one response, but different guilds have different cultures, and some work better different ways, and not everyone wants to talk to people. I like talking. I like communicating. I am quiter now then I probably have ever been. But things that None Elitist Raider’s blog post made me consider about exclusivity was that even in our chatty guild, when Aion came out the people playing Aion sat in that channel as an exclusive club, probably making the people who weren’t playing it feel a little excluded, and I realise that even when I sat my own private channel talking to someone in my last raiding guild after raid, was probably not conductive to keeping conversation open. I paid particular attention to my Vting and MBing on Hal Trash ( not much good on Hal himself.. I got meleed going into the portal on p2. Guess I clicked too fast.) 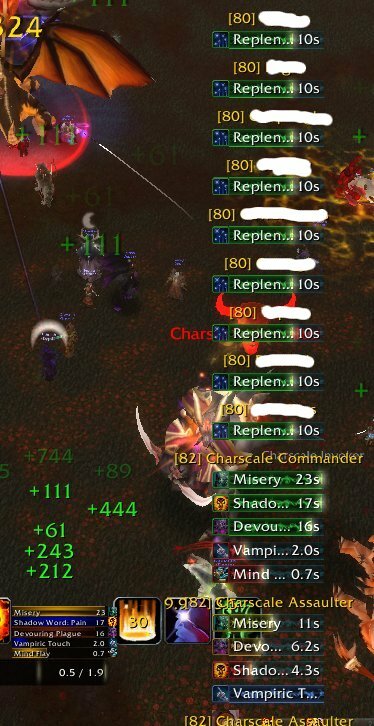 but except one or two MB’s I know with absolute certainty I was Mbing with VT.
Only 3 people got it – but it proc’d and the whole raid was in range. So is it supposed to proc on 10 toons/pets at the same time but it’s not. Boring post on replenishment. Doing some working out. Skip to end for conclusion. 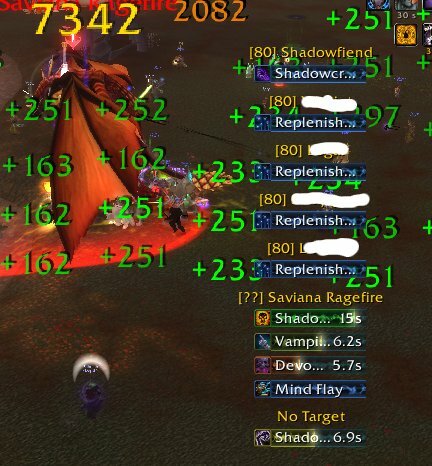 There were complaints around the 4th attempt about lack of Mana regen as I was the only one procing it, and I was instructed to ” make sure I was procing it” One Pally had left the raid, and the other one was not doing what ever he was before to proc it all the time so I wasn’t aware that I was the only source. So I need to Mindblast while VT is up to proc replenishment – and it has a 100 yard range. It also refreshes if you proc it again in that 15 secs – so there will be some overlap, as some people will still be on that list so instead of application 1 running for 15 secs on say Bob. If it gets refreshed at say 10 secs, he gets 10 seconds of Application 1 , and 15 sec of Application 2 especially if BOB runs at low mana all the time, but then bob might get it at 10 sec of application 2 and so on.. – which means 5 ticks is lost just on one person if I am MBing more then once every 15 sec. If I was refreshing it too often then the numbers of ticks would also be lower in comparison to how many MB’s there are, and if its safe to stand still I probably am casting MB more than when I am on the run, need to move, refresh dots, get off the boss, chase gas/oooze Run run MB . move again. 18 Mindblasts in that attempt , and to be perfectly honest If I’m hitting the gases, and they are almost dead I am not going to refresh dots when I can MB, so that may explain why some of my MB’s aren’t procing. 16 x (15×10) = 2400 52% of the time. so my 69% was higher. I was MBing more though – which I was under the impression should not be necessary. I have kept my 5/5 Mindblast CD reduction, but a lot of 4 piece t10 builds haven’t, and put the points into things like inner focus, and threat reduction, and improved VE. Not every mindblast is cast with the intent to Proc Replenish. I should have VT up as often as possible, but if it falls off mid cast, I’m not going to stop MB reapply the dot then recast MB that would be a dps loss. If I worry about mindblasting more than I let dots fall off because MB is more important when VT is up then reapplying DP, or sticking all my dots on target, and then Mindblasting. It also depends on how many times I need to move. H PP means lots of movement – running away from things. If you stand still you get hit with Goo while you have 2 stacks of disease. ( happened twice) so I fail more often. Vt’s shorter uptime, means it falls off quicker, it also has a cast time, and very difficult to cast on the run, which I why DP and SWP are easier to stick up while getting into position. If your stationery VT will go up first most of the time. 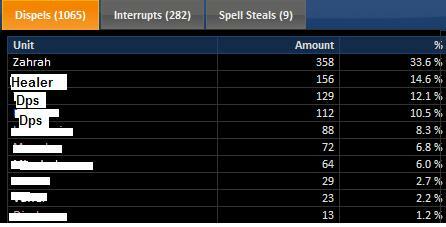 So I went to look at another PP fights we still had logs up for. We one shot him last week – and I found another thing to consider. This shows me that I am not MBing enough. It would be helpful to know if I’m on the one who will be procing it. Pets also have mana, and will use a replenish tick, or a couple, or a thousand or so. .
Ok I don’t really feel that way all the time. I don’t know maybe I’m clutching at straws and excuses. But just when I feel when I start feeling like I am doing better dps wise, and I have been. I fail at Procing replenishment enough.